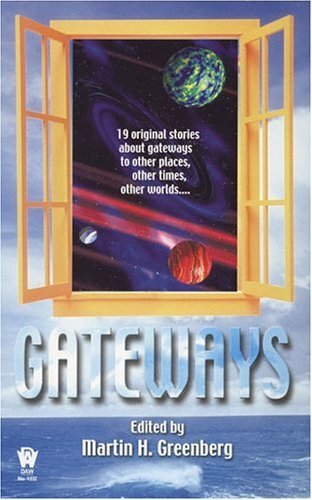 When I started out to write a story for an anthology about gateways, I started out thinking that gateways are always doors, or gates, or portals (usually Gates or Portals). What could I do that would be different? What if it were a manhole, or in the air? Or really big, like a harbor? Or really small, like a ring or a bracelet? That last idea intrigued me. Why would anyone build a really small gateway? Who could make use of it? Thinking about that led me to the idea of a priestess from a mountain goddess cult who is stuck in a city under siege. Just to make life interesting, the city is in the middle of a flat hot desert and she hates everything about it. Her bracelet, when activated by the appropriate magic word, forms a little gateway to a meadow near her home nunnery. It’s not an item of great power, it’s just a trinket. Its purpose is to bring her the smells of home — wildflowers in the spring, snow in the winter, etc. But how could such a tiny thing be the foundation of a story? Well, I figured out a way. You’ll have to read the story to find out. I will tell you that the solution involves an old, old square dance call named “Rip And Snort.” And thinking about how the square dance couples would be named in an illiterate medieval society led to the idea of naming them after the Chinese compass directions: White Tiger (East), Blue Dragon (West), Red Phoenix (South), and Black Turtle-Snake (North). I didn’t use that idea in the story, but it led to the idea of setting the story in a pseudo-Chinese rather than pseudo-European fantasy land. The story takes place in a fantasy China based on the Warring States period (c. 200 BC), predating cavalry and gunpowder but with limited magic instead. The good general and the evil general are based on historical personages (Liu Pang and Hsiang Yu respectively) and many of the details, including the rhinoceros-hide armor and the fork-carts, are from my research. But mostly it’s all made up. Note: The Chinese words in the paper publications of this story are a mish-mosh of Pinyin and Wade-Giles transliterations. Thanks to eagle-eyed proofreader Chaz Brenchley, the ebook version of the story includes consistent Pinyin transliterations. I also changed the names of some characters and places, to avoid confusion. Su’s spirit soared above the town, with its courtyards glimmering with the torches of Chang’s remaining troops. Quickly she flew over the walls, and the moat beyond them, to the plain below the town where Yao had massed his army. Thousands of fires burned there, in rigid rows and columns. Su knew nothing of armies, but she could count, and even she could see that Yao’s army vastly outnumbered Chang’s forces.But there, in the center of the camp, was one tent larger than the others, which swarmed with soldiers coming and going like an ants’ nest. Su swooped down upon it and through its fabric roof. She recognized Yao Ming at once — she had seen his scarred, dark-bearded face in many scrolls and woodcuts. He wore an armored surcoat, fashioned of many palm-sized squares of rhinoceros leather, over a blue robe with black trim. At the moment he and his lieutenants were bowed in concentration over a smoking brazier. The smoke from the brazier stung her eyes as she moved closer, trying to hear their conversation. But they were not conversing — they were praying. Foul prayers to the black demons worshipped by the Tung. She would learn nothing useful from this, so she moved behind Yao, to a low table where maps were spread out. As she peered closer, trying to make sense of the maps’ rough markings, the prayers reached a feverish enthusiasm, the Tung men shrieking and swaying as they waved their hands over their heads. Finally they all shouted four words together, and Yao threw a handful of mulberry leaves into the brazier. Su coughed in the choking smoke. But… this was wrong. Smoke should not affect her spirit body. This was no ordinary fire. Panicking, she gathered her spirit self to flee. But before she reached the tent roof, a huge, taloned hand darted out of the smoke and grabbed her by the foot. “Ai!” she cried. Helplessly she struggled as the rest of the black demon coalesced into being. It had the form of a huge, muscular man, barely able to stand erect at the center of the tent, but its face was distorted by enormous fangs and protruding eyes and its skin was charcoal-black. The hand that held her foot was hard as stone and ridged with muscle. “Release me, demon, in the name of Kuan Shih Yin!” But her words had no effect. “What have you caught, oh my demon?” asked Yao. He had heard nothing. “A spying spirit,” the demon replied, in a voice like stones grinding together. “As my master wishes.” The demon reached up with its other hand and grabbed Su by the neck, then pulled her down to the floor of the tent. Her boots thumped on the dirt, and then the demon forced her to her knees. She gasped at the pain, then gasped again at the realization of what it meant. The demon had pulled her material body into the tent!